We’re doing something new over here, which are peeks inside magazines a.k.a mini magazine reviews! I love magazines…like LOVE y’all…so I am super happy to add this as something we can do here on Bah+Doo because I want to share my love with others and I want you to love them too. SO LOVE THEM, OKAY. Right now we are going to try and do one magazine review a week (or so) and see if we can stick to it. I’ve never seen anyone do a magazine review online, so I am kind of at a loss as to how to do it, so bear with me. I think I’ll just go through their table of contents and summarize each section with photos and possibly links? We’ll see. Okay, so I thought I would start with a quick summary of the magazine so you would know if you want to spend $50+ to buy it online somewhere (seriously, these magazines cost that much when you add in shipping, it’s crazy and ridiculous). I want to first comment on how beautiful 1st Look’s magazine is. I mean, I love their website, but their magazine is a cut above. If you have never seen a 1st Look magazine it looks kind of newspaper-like in that it is HUGE like a newspaper. Very tall and wide, but not thick. It is also filled with color on the inside like skittles are dancing all over it. Love. So, to give you this summary I thought I would just take you briefly through the table of contents. So first off is the First View which is everything that is fabulous in fashion beauty and culture of that month. This section is several pages long and is packed with things to check out. For instance this month they have the men’s fragrances Penhaligon’s – the duke of perfume which is Rose scent with hint of pepper, Byredo (a spicy and thick herb scent), Aesop (inspired by Japanese forests and temples, I have to smell this one! ), Dior (Calabrian bergamot and grape fruit), Bottega Veneta (a spicy Cedar tree scent), and Annick Goutal (Bombay wood scent). They go through some other pretty cool items like a cardboard plant filter which are plant looking cardboard cutouts for the home which is by Nextmade in Italy and the top five dry lip balms of October (Dr.Jart+’s Ceramidin Lipair Tint, Fresh’s sugar candy lip treatment SPF 15, Junsaemmool’s Essential tinted lip glow, Kiehls’ Lemon butter color lip balm, and L’occitane’s pivoine sublime tinted lip balm. If you are into products then this magazine is worth checking out for the First View section alone. Next up is New Faces which shows us who or what is hot at the moment from all over the world. It is really interesting to me because who/what Korea thinks is hot is often times different than who people in the States thinks is hot but it is also the same every now and again (I mean Beyonce is always on the list right?). 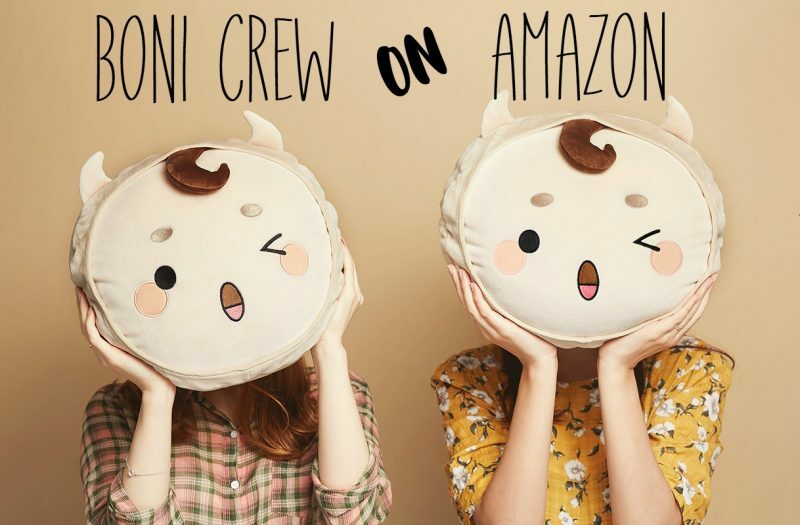 The New Faces they have listed are brands Ava Molli and Amy Eujeny. Avi Molli is a contemporary traditional brand that just launched this Fall with back street London style. Amy Eujeny is a high-end luxury brand and the first Korean watchmaking house that can manufacture it’s own watches. The Growing Man interview is also the cover model, Yoon Kyung-sang. We will dedicate a whole post to translating that interview. What what! Expect that up sometime soon-ish. 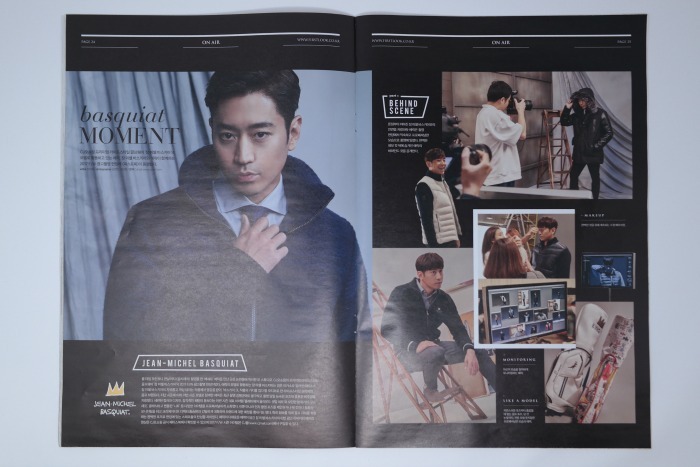 The Basquiat Moment is a commercial shoot with Eric Mun and also includes a behind the Scenes interview from the shoot. We’re not sure if we will translate this part or not, though I am inclined to; Kim Rae-won is next us and gives us some fall fashion tips with French Chic, Daniel Cremierux. This section, like the Basquiat Moment, is several pages long and filled with gorgeous photos. Though Kim Rae-won’s section doesn’t have an interview, it does show how to pair clothing and accessories together. Kim Rae-won has a new drama in the works, so expect to see a lot of him soon. 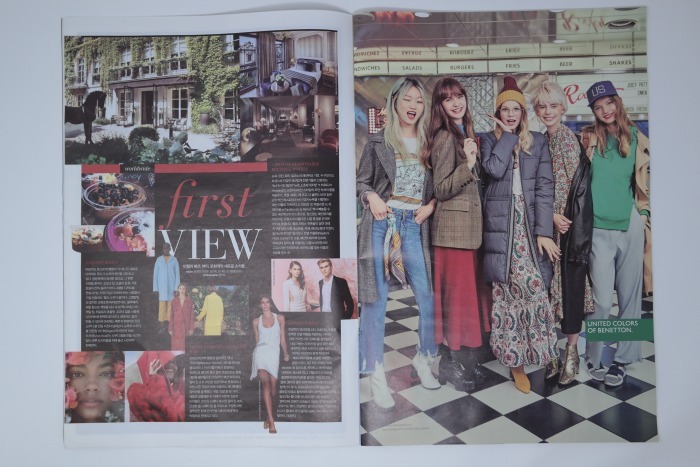 The magazine also shows us Generation Next Stars with the new designers on the block: Hwang Ha-yeon, Lim Soo-hyun, and Lee Jun-hoo with page long interviews for each. I am all about clothes and I love designers, especially up-and-coming ones, so this section was right up my alley, I loved this section. Speaking of clothes, Endless Journey is dedicated to Seoul Fashion week with images taken by Ogh Sang Sun, Cho Gi Seok, Koo Bohn Chang, and Kim Je Won. Next up are the Movies of BIFF 2017 which is also right up my alley, followed by What’s OTT (which stands for Over The Top) in media and films for October. The shows they mention here are so diverse. They mention Star Trek: Discovery on Netflix and even go through some episodes you have to check out (S4Ep1, S3Ep26, S7Ep24). Of course Stranger Things 2 get’s a shout out. Don’t anyone spoil it for me! I am marathoning it Thanksgiving weekend, it’s an entire plan and everything. 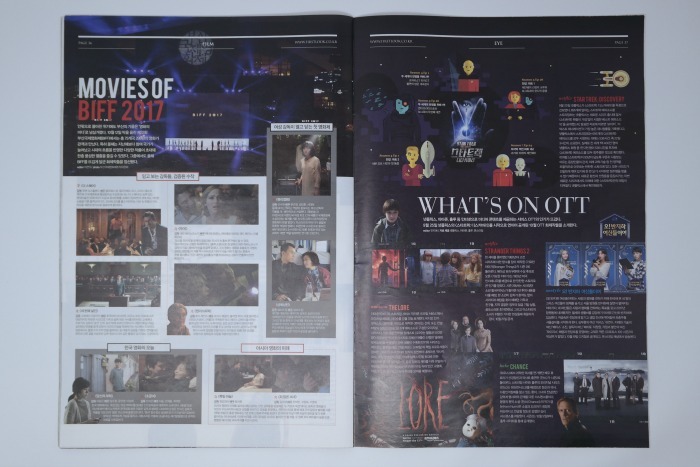 They also mention the spooky Amazon Prime show The Lore, Hulu’s Last Chance, and the web drama 오! 반지하 여신들이여 (Oh! Dear Half-Basement Goddesses) which I have checked out, but I only saw the first few minutes of the first episode. It was so strange. I might give it a second look though. There is a culture section in 1st Look which they call Life/Culture and it covers everything from exhibitions, music, movies, books, stage, and tv. Some things they mentioned in this section were music from Michael Jackson’s Scream, and Sam Smith’s Pray; the TV shows Black and Revolutionary Love; the exhibition The Art of the Brick (which looks kind of like an adult Lego’s exhibition), three books (that are always hard to find outside Korea/Japan) and three stage shows (Memories of Matsuko, The Scarlet Letter, and Checkhovs Reading Woman – Anton Checkhovs unpublished shorts) that I would definitely check out if we lived in Korea. 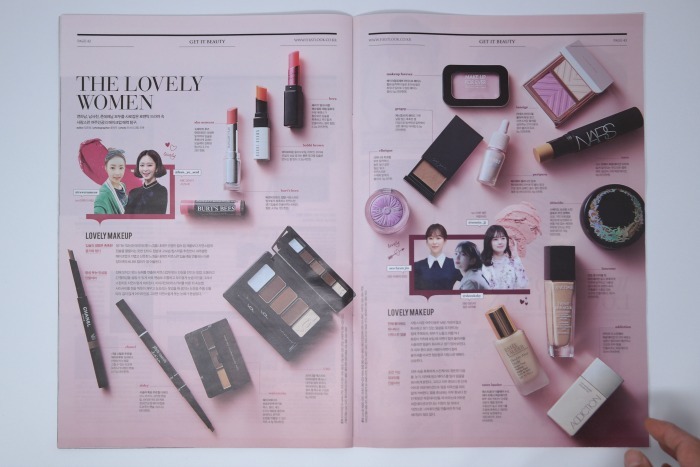 After all the culture (thank you 1st Look) we get back into all the pretty things with Lovely Women which shows us exactly how romantic drama heroines woo men using their make-up (Bobby brown, Hera, Sisley, Peripera, Addiction, etc.) and follows it up with all the must have beauty items to keep your face looking like pores are not a thing that exists on your face (A-derma, Dr. Jart, Iope, MakePrem, Medicube, Dr. G, etc.). They end with showing us the Places to visit of the month (all restaurants that I must eat at right now!) and a question as to if family variety shows are good or bad? I personally think there is nothing good about them, but only because I don’t think little kids will like being on variety shows when they are much older (like teenagers), but that’s just me. I haven’t actually seen any of the family variety shows in Korea, but if it trends like US family reality shows then…no. And this summary was pretty long which will give you a little taste of how long these peeks will be. But, like I said this is a tester to see how we can possibly do magazine reviews, other peeks will be shorter. Or you know, shorter-ish. Or longer? 1st Looks magazine is available on their site around a week after it comes out. Just scroll to the bottom and you’ll see it. The version online doesn’t have any of the ads which could be either a good or bad thing if you like advertisements or not. 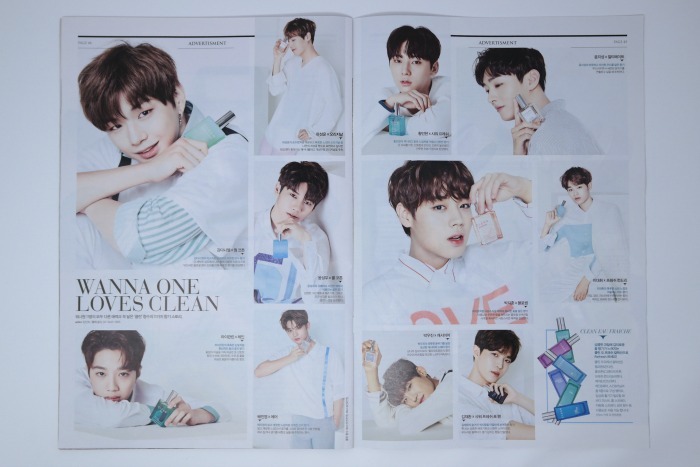 Wanna One was in the Clean beauty ad in this issue so if you love them then you would probably love to see that ad. We will have more peeks to come, though we might not share as many images in some of the other magazines due to Copyright infringement and all that stuff. We’ll have to read about it some more. maybe we can open a forum to give a bit more info on the magazines? I don’t know. If anyone knows how to start a forum then let us know. 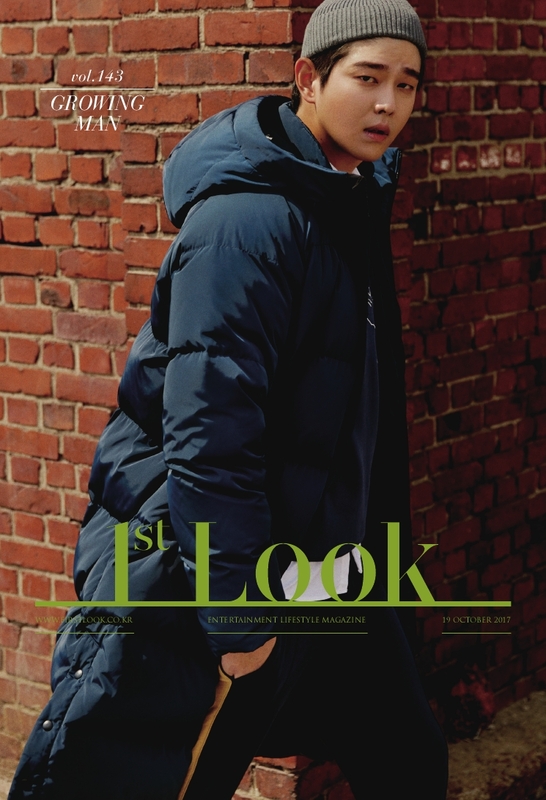 Since 1st Look provides their magazine online for free, we thought it was a nice one to start with. Also, don’t you just love 1st Look. AHH, I LOVE THEM.